Each winner is truly worthy in its segment. The field of great cars on sale today is remarkable. Sure, there are still dogs that no one should touch, but for the most part, cars made today are quite good, while others are truly great. At this year's Detroit Auto Show (aka North American International Auto Show), three models walked away with big awards. And though none of them come as a surprise to us, they might be considered underdogs compared to those who might be thought of as typical winners. The new face of sports sedans reigned supreme in Detroit. Yes, it's that good. 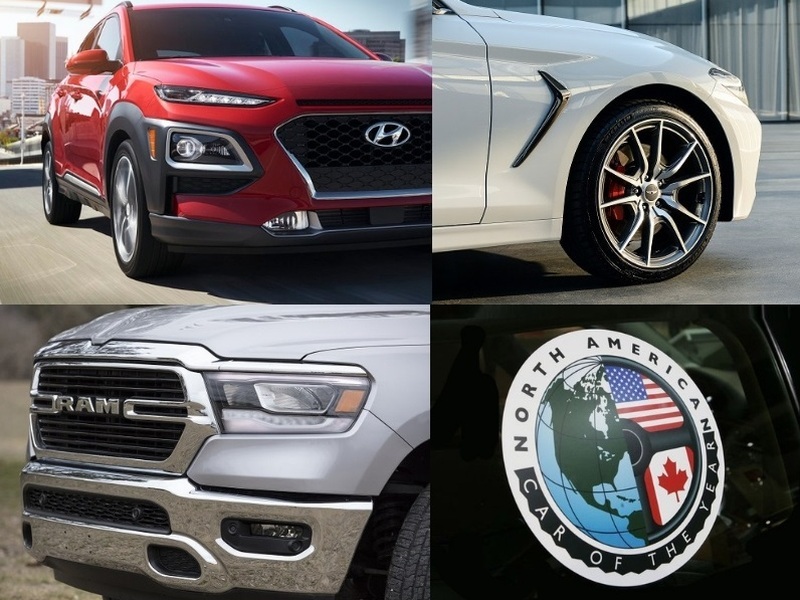 The Hyundai Genesis G70, Hyundai Kona/Kona Electric and the Ram 1500 pickup took the podium for North American car, sport utility and truck of the year awards. Two wins for Hyundai/Genesis is almost unheard of. They beat out some solid candidates that were pretty impressive, as well. The competition was stiff, but we wholeheartedly agree with the choices. No advertising influences the choices, so voting remains as objective as possible. The award is significant, and manufacturers heavily market if their show pony wins. The G70 is so rewarding to drive, handsome, and seriously luxurious. It ticks all the boxes. The G70 is a shocker, really. Well, we weren't surprised because we just drove it and completely fell in love with it thanks to its potent twin-turbo V6 engine (optional), opulent interior, original styling, and available all-wheel drive. The fact that its the first effort by Genesis to create a wholly original sports sedan is the part that's mindblowing. Better than BMW, Audi, and Mercedes-Benz, in our opinion, and the opinion of others, apparently. The G70 beat out nominees such as the new Honda Insight sedan and the Volvo S60 sedan/V60 wagon. Last year's winner for the category was the Honda Accord. The Kona Electric was praised by so many auto critics for its driving, style, and efficiency. The Hyundai Kona and Kona Electric took the crossover/SUV segment by storm thanks to the edgy styling, crisp driving manners, and overall utility. The fact that Hyundai gave us an EV version of it that gets an astounding 258 miles of all-electric range on a single charge is perhaps the sweetest part of the Kona lineup. It shows us what a practical EV can do as an everyday commuter vehicle. This year, SUV nominees that went up against the Kona were the new Acura RDX and the Jaguar I-Pace. Last year's winner was the Volvo XC60. The Ram 1500 Rebel is the off-road version of the 1500, and it can take the punishment. You don't have to tell us how great the Ram 1500 is since we chose it as our Truck Of The Year. So did Motor Trend. Well, now it's garnered the top award for the country by stealing the award from Detroit from the likes of the Chevrolet Silverado 1500 and the GMC Sierra 1500. The Ram 1500 looks the part and has premium ergonomics and interior comfort, as well as the kind of space and power that's reserved for bigger trucks. We'd take this thing anywhere. Last year's winner was the Lincoln Navigator.